The apparent diffusion coefficient, as explained by its naming, is the diffusion coefficient "appearing" from the observation of a heterogeneous environment (e.g. biological tissues). Apparent diffusion coefficient has numerous applications in imaging diagnosis. 1. Biological tissue has a microscopic structure that limits diffusion. The exponential relation does not hold if there is restricted diffusion. 2. ADC is an ensemble measurement of how fast water diffuses in a complex diffusion environment. Consequently, in an environment mixed with free diffusion and restricted diffusion, ADC only reveals an overall measurement and is thus b-value dependent. 3. The ADC measurement is directionally dependent. The measurement parallel to white matter bundle is higher than that perpendicular to the bundle. 1. b-value is a product of three parameters related to diffusion sensitization, including diffusion time, diffusion gradient strength and duration. 2. The apparent diffusion coefficient is the "measured diffusion coefficient" of water in biological tissues. 1. How to estimate ADC using a diffusion MRI data set? 3. What are the pros/cons of using a low b-value acquisition for ADC estimation? How about a high b-value acquisition? 4. In human brain, white matter ADC obtained from b1 = 1000 mm2/sec and one b0 is ~0.8 x 10^-3 mm2/sec. The ADC value acquired from b = 3000 sec/mm2 is ~ 0.6 x 10^-3 mm2/sec. Why is there a difference in ADC measurement? ADC may not be uniform at all orientations, and there is a need to model the difference of ADC at different orientations. Peter Basser introduced diffusion tensor imaging in 1990's . He used a tensor to model the orientation distribution of the apparent diffusion coefficient. The tensor model is by far the most popular diffusion model used. To understand the tensor model, one may compare it to a 3D Gaussian distribution. Here the diffusion gradient g come with an additional unit vector of it orientation, "g hat", and the diffusivity D can be replaced by a 3 x 3 matrix, known as the tensor. The principle direction can be calculated by eigenanalysis. Figure: Jellison, Brian J., et al. "Diffusion tensor imaging of cerebral white matter: a pictorial review of physics, fiber tract anatomy, and tumor imaging patterns. "American Journal of Neuroradiology 25.3 (2004): 356-369. DTI allows for measuring diffusivity at any 3D orientation and provide principle direction that tells axonal direction. It also provides diffusivity-based metrics for characterizing diffusion biophysics. 1. Diffusion tensor assumes that the diffusion is Gaussian distribution, but, in reality, the diffusion in biological tissue is often restricted by microscopic structures. 2. Diffusion tensor cannot model multiple fiber populations. 3. Diffusion tensor also inherits the limitation of ADC: b-value dependency. 1. A diffusion tensor is a 3D presentation of the diffusivity. 2. A tensor can be analyzed to get the principal direction. 3. A diffusion tensor assumes Gaussian distribution. It cannot model restricted diffusion or multiple axonal directions. 1. What is the minimum requirement of diffusion images for calculating a tensor? 2. How to estimate ADC using a diffusion tensor data set? 3. Is the diffusion tensor affected by T1w, T2w, or spin density? Does it scales with spin density? 4. Does T1w, T2w, spin density affect FA and diffusivity measurement? 5. How do eddy current artifact, susceptibility artifact, motion artifact, and fat sat artifact affect DTI reconstruction result? 6. Is diffusivity a b-value dependent measurement? How about FA? 7. If the b-table in flipped or swapped in x,y,z direction, does it affect FA, RD, ADC? A tensor can provide fractional anisotropy (FA), axial diffusivity (AD), radial diffusivity (RD), and mean diffusivity (MD). AD, denoted by λ parallel, quantifies how fast water diffuses along the axonal fibers. It is estimated by λ1, the first eigenvalue of the tensor. RD, denoted by λ perpendicular, quantified how fast water diffuses across the axonal bundles. It is estimated by (λ2+λ3)/2, the average of the second and third eigenvalues of the tensor. MD is the diffusivity average from the three eigenvalue of the tensor. It is often regarded as an approximation of the overall ADC. FA is a fraction derived from the ratio between λ1, λ2, and λ3. It has a value ranged from 0 (isotropic) to 1(totally anisotropic). In general, good myelinated fibers have high FA and low RD (Chang 2017). When there is demyelination, RD changes dramatically (Song, 2002). If there is axonal loss, the AD drops (Song 2003). Many studies have used RD specifically for myelination due to the demyelination studies. However, the fact that demyelination has RD change does not mean that good myelination is also reflected by RD (Change 2017). The interpretation of RD requires additional caution. Numerous studies have investigated the relation between diffusivity and pathological conditions. Myelination: FA (Chang, 2017), RD (partly, Chang, 2017). Figure from Zhang, Jiangyang, Manisha Aggarwal, and Susumu Mori. "Structural insights into the rodent CNS via diffusion tensor imaging." Trends in neurosciences35.7 (2012): 412-421. In 1990, Michael Moseley showed the clinical application of diffusivity. His study showed a decrease in water diffusion in the early phase of acute brain ischemia in a cat brain. 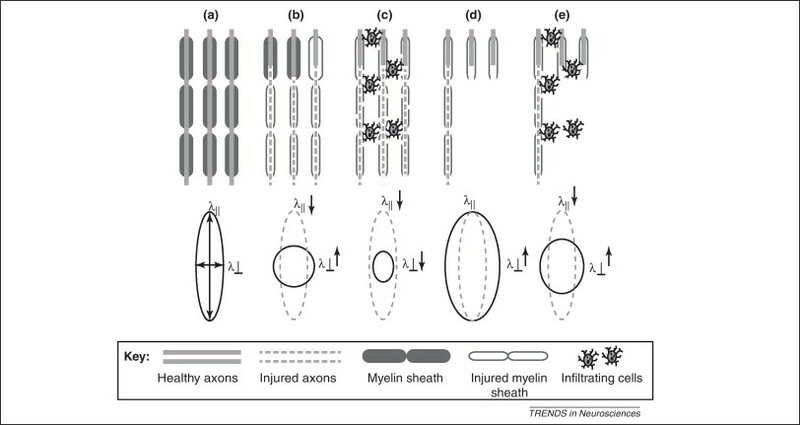 Diffusivity provides a noninvasive way to study axonal injury, demyelination, edema...etc. 1. It assumes single fiber population. In other words, in place with crossing or branching fiber, the diffusivity measurement is not accurate. 2. Partial volume effect. Diffusivity is an overall estimation of how fast water diffuses. If fast and slow diffusion components coexist, the overall diffusivity can be increased or decreased. The following image show the partial volume problem in diffusivity-based measurement. The diffusion phantom examines three types of the partial volume effect: (a) fibers/free water, (b) fibers crossing, and (c) fibers/non-diffusive materials. 1. A study found that AD is significantly decreased in a brain region. What would be the possible explanation for the change? How about FA, RD, ADC? 1. Download sample DTI data at https://pitt.box.com/v/course-dti. Reconstruct DTI from DWI (follow instructions in Reconstruction(DTI, QBI, DSI, GQI, QSDR)) and generate FIB files. 2. Load the FIB file in STEP3 fiber tracking to visualize FA map, ADC map, fiber direction map. Is the FA map noisy? Where are the noises coming from? 3. Choose a brain region with crossing fibers. What does the fiber direction map show in that region? 4. Delete one or two DWI in the data set and reconstruct DTI again. Can DTI work on the dataset? Does this affect the FA, ADC? Why or why not? 5. Manually rotate the SRC file (instructions in Reconstruction(DTI, QBI, DSI, GQI, QSDR)). Do those diffusion indices change due to the rotation? Beaulieu, C., 2002. The basis of anisotropic water diffusion in the nervous system - a technical review. NMR Biomed 15, 435-455. Budde, M.D., Kim, J.H., Liang, H.F., Schmidt, R.E., Russell, J.H., Cross, A.H., Song, S.K., 2007. Toward accurate diagnosis of white matter pathology using diffusion tensor imaging. Magn Reson Med 57, 688-695. Gauvain, K.M., McKinstry, R.C., Mukherjee, P., Perry, A., Neil, J.J., Kaufman, B.A., Hayashi, R.J., 2001. Evaluating pediatric brain tumor cellularity with diffusion-tensor imaging. AJR Am J Roentgenol 177, 449-454. Kono, K., Inoue, Y., Nakayama, K., Shakudo, M., Morino, M., Ohata, K., Wakasa, K., Yamada, R., 2001. The role of diffusion-weighted imaging in patients with brain tumors. AJNR Am J Neuroradiol 22, 1081-1088. Song, S.K., Sun, S.W., Ju, W.K., Lin, S.J., Cross, A.H., Neufeld, A.H., 2003. Diffusion tensor imaging detects and differentiates axon and myelin degeneration in mouse optic nerve after retinal ischemia. Neuroimage 20, 1714-1722. Song, S.K., Sun, S.W., Ramsbottom, M.J., Chang, C., Russell, J., Cross, A.H., 2002. Dysmyelination revealed through MRI as increased radial (but unchanged axial) diffusion of water. Neuroimage 17, 1429-1436. Song, S.K., Yoshino, J., Le, T.Q., Lin, S.J., Sun, S.W., Cross, A.H., Armstrong, R.C., 2005. Demyelination increases radial diffusivity in corpus callosum of mouse brain. Neuroimage 26, 132-140. Sugahara, T., Korogi, Y., Kochi, M., Ikushima, I., Shigematu, Y., Hirai, T., Okuda, T., Liang, L., Ge, Y., Komohara, Y., Ushio, Y., Takahashi, M., 1999. Usefulness of diffusion-weighted MRI with echo-planar technique in the evaluation of cellularity in gliomas. J Magn Reson Imaging 9, 53-60. Chang, E. H., et al. (2017). "The role of myelination in measures of white matter integrity: Combination of diffusion tensor imaging and two-photon microscopy of CLARITY intact brains." Neuroimage 147: 253-261.